I love doing nail art and I am always looking to expand my nail art supplies with new and interesting products. I was very kindly sent a sample of Liquid Palisade to try out and here is my experience with it. "Liquid Palisade is a paint-on temporary barrier that protects against unwanted polish mishaps. You'll simply peel it off like a stretchy string after polishing for the perfect custom manicure or pedicure every time. By painting on liquid palisade wherever you don't want polish (ie. 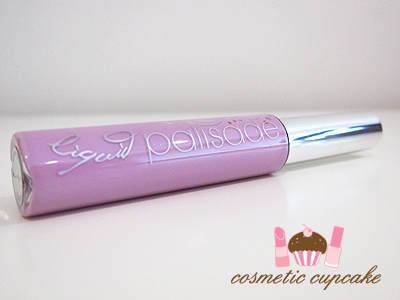 on your cuticle or when polishing for a frenchie) you'll end up with colour only where you want it, not where you don't." 1. 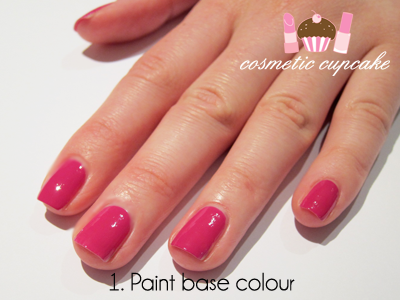 Paint base coat and then apply a base colour of your choice. Here I've used 1 coat of OPI Dim Sum Plum. Let it dry completely. 2. Shake your bottle of Liquid Palisade well before using. Apply it to places where you DON'T want nail polish. For example for a French tip, apply along the curve. Ensure you leave a little 'tab' on the sides so you can remove it after it dries. Let it dry completely. When it's dry, it goes from a pastel purple colour to a darker purple colour. 3. 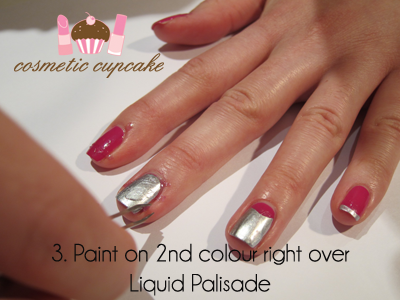 Paint your 2nd colour over your nail including over the Liquid Palisade. It's best to choose a one coater as your 2nd colour as you'll need to work quickly. Here I've used China Glaze Millenium. 4. Peel Liquid Palisade off when your polish is half dry. It doesn't work as well if your polish is fully dry. I used tweezers to make it easier to grab the Liquid Palisade. Finished result! Not the best as you can see but I wanted to show you a few different designs that you can do. So how did I go? I found it a little difficult to get the hang of using the product at first. The brush is a little floppy so it was difficult to control initially - at times it didn't create straight lines for me and I had to tweak it after applying it. 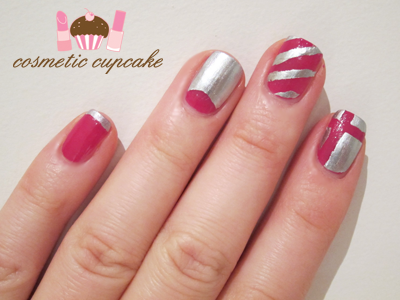 After a few goes I got the hang of it though and I found it was fantastic for creating half moons and french tips! It was easy to do and the result was very neat. For the more complicated designs I need more practise as you can see from my pics. * Simple concept - paint, apply, paint and peel! Would I repurchase? : At $22US for a bottle, it's above my price range to purchase regularly unfortunately. I'll definitely be using it for half moon manis and french tips as it just makes it so quick and neat! However, I do prefer to freehand nail art as it creates an extra step which I'm lazy to do every time I do nail art. A big thank you to Jacqueline from Kiesque for providing Liquid Palisade for my consideration. You can purchase your own bottle from the Liquid Palisade website. I was sent the above product to sample but this in no way influenced my review in any way. All my reviews are my 100% honest opinion. 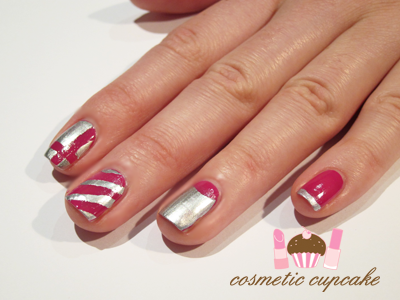 Do you enjoy nail art too? 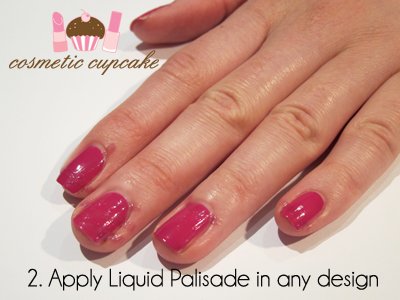 Would you try a product like Liquid Palisade for your manicures? I was all like, 'OMG where can I get this!?' and then I saw the price... bummer. An awesome concept though. Oh my god that actually looks REALLY cool!! I'm going to looksy on ebay now for it!! Nope, not something I would use. It looks too messy for me. But I have french tip and Konad stamping down pretty pat so I see no reason for me to go out and buy a bottle. It would be a good priduct for naiul art beginners but the price would put off most people. Good clear pics tho Chelle! Thanks! What an interesting looking product! And like you said, would probably be perfect for nail art newbies like moi :) Your right though, it is a bit pricey :/ Thanks for the great review! Cute! I love this color combo. @Leah: It's definitely a very interesting product! I haven't seen another product like this on the market so I guess that's why the price is on the higher end. @Angela: Yeah the price unfortunately is the major issue! If it could be a little cheaper that would be great. @Mez: Good luck on ebay hun!! I wish I had this when I started out doing nail art. @Carli: Yeah it's definitely a product that's great for beginners. Is it a little messy by the time you finish all fingers but it's not as messy as konading lol. @Aysh: Glad you liked it Aysh. @Alice: With freehand there's no extra step so it takes up less time. @Jennifer Leigh: Glad you like it! Sign up to follow @kiesque on twitter! Ya never know when they will run a giveaway! !